Chicken soup can be very easy to make and this one is a great example. You can make this recipe in stages throughout the day and the longer it sits the better. This dish was inspired by the Passover Chicken Soup recipe from the Kim Kushner Cuisine Blog. I made mine differently than hers-but you may want to check out her version and her other simple and delish looking recipes. I have never used this method for soup making and I will surely be trying it again in different ways. Bring to a boil, then cover and simmer for 40 minutes. 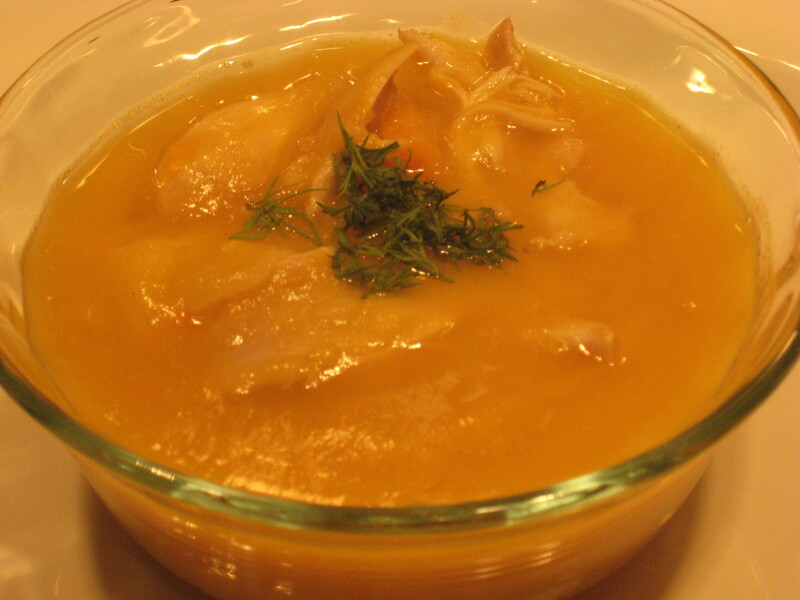 Remove chicken and dill then puree soup (keep it chunky). Remove chicken from bones and put bones back to soup. Simmer uncovered for 30 minutes. Add chicken back in (remove bones) and serve.